occurring all over the country repeatedly for past few years. its report to C.M. on regular basis. charge in addition to his present responsibilities. Varanasi, Allahabad, Agra, Meerut, Faizabad, Mathura and Kannauj. Arthik Madad Yojna and apprise the C.M. of the inferences. implementation of these schemes is under progress. some important changes at the highest level of the government. “Oh, it will be marvelous Lord!” said the king. “Yes Lord, I am Kapila”. said the fish. brothers became monks in the Holy Order of Lord Kassapa. himself commended for his accomplishment. This intellectual pride made him very controversial and he began to loose his popularity. it a pompous name, which was rejected by the Maha Sangha. man, he was reborn in the Avici hell, the most frightening of all hell worlds. the arising of the two Buddhas, Lord Kassapa and Lord Gotama. fishermen and the fish to the Buddha. the goal of spiritual life. Like one searches for fragrant birana grass root. Let not Mara repeatedly crush you. As the flood crushes reeds. 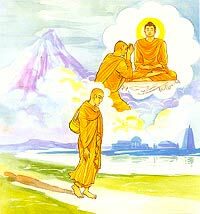 radiant young bhikkus endowed with all the eight monastic requisites. shouted: “Wonderful, indeed, O Lord! Marvelous indeed O Lord!! Sadhu! Ones, Awakened disciples of the Supremely Awaken Buddha! point is the futility of mere learning without practice of Dhamma. experienced, energetic and purposeful existence. in any branch of knowledge and discipline. C.M. writes letter to P.M.
Fund scheme for widening and strengthening of State Highways. Minister, Government of India on 24-11-09, in which he apprised Mr.
Rs. 260 per quintal at present. payment has been made before this time limit. therefore with the incentive payment amount the cane farmers are getting Rs. are getting the payment of Rs. 260 per quintal. farmers would be severely dealt with.